Recently, postings of job openings for international students from domestic companies are easily seen on school homepage. As the increase in overseas expansion of domestic companies, there are increases in demand of diverse members of organizations as well with the effort for becoming global company. Especially, international students who have global mind and a deep understanding in foreign languages and both local and foreign cultures are receiving attention from those domestic companies. In terms of international students, they are the students who study in Korea and have acquisition or pre-acquisition of bachelor’s or master’s degree. In the past, the companies tended to hire international students irregularly but nowadays, they employ international students by open recruitments. Accordingly, the competition between international students is also growing. For the first half new open recruitment in Samsung, 700 international students from 47 countries have applied and it is about 4.7 times of number when compare to 130 applicants from 2009. The number of international students has rapidly increased by 89,527 in 2011 from 16,832 in 2004. Moreover, the number of students who study in Korea for acquire degrees, except the students who visit Korea for short-term language courses, has arisen to 63,653 in 2011 from 11,121 in 2004. This statistics shows that not only the quantity of international students but also the quality of them has been improved. With this change, according to the research from Jobkorea, the nation’s job information website, domestic companies who are in consideration of hiring international students doubled up last year from 22% in 2010. 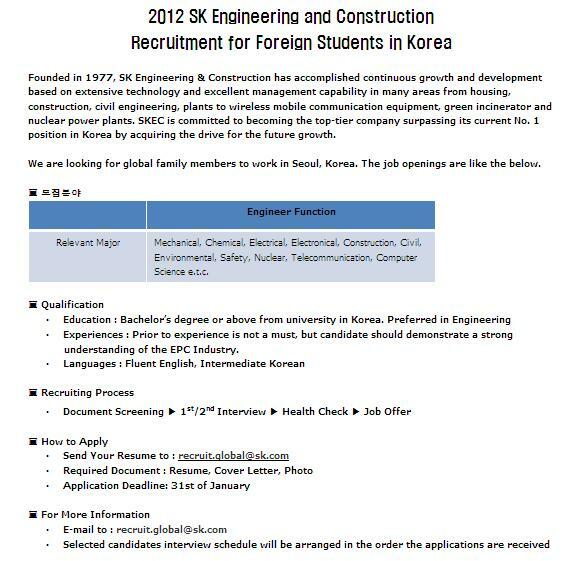 “There are not a few international students who want to work at Korean companies. About twice a week, international students come to office to get help for writing resumes and cover letters. Similar to Korean students, it is also important for international students to have good GPA and outside activities such as volunteering work. The most important part for them is getting high score on TOPIK (Test of Proficiency In Korean),” said Heo Jeong-in from Service Center for Foreigners. Secondly, from the aspect of the companies, international division and exportation and importation department are the major recruiting divisions. They are mostly in need of international students for foreign assignments, reinforcement in international exchange, encountering foreign clients and securing native work force for overseas expansion. For instance, GS Engineering & Construction Corp. is one of the companies which focus on employing international students. Since there is increase in overseas construction, the demand of international work force also increased. According to the company, they are planning to hire international students who are familiar with Korean culture and maximize the human resource for glocalizing the business area. For this reason, there were 40 foreign employers in the company in 2009 and it multiplied 5 times and it was estimated by 220 in last year. Kumho Asiana Group is another example for domestic company who is adapting the recruiting trend. Last July, for the first time, they hired six international students including five from China and one from Thailand as new employees and two interns including students from Australia and China. It was because recruiting international workers has advantage that they can be put right away into the field where foreign language skill and comprehension of cultures are needed. Also, to hear some useful information and real stories, post interviewed Vui Thi Van Ahn, an international student from Vietnam. She graduated Graduate School of International Trade in Dongguk University last August and currently works at URS. URS is a branch company of Kumho Tire and they provide certificate for environment, communication and Quality. Her task is to supervise the work of URS’s branch in Vietnam. “In my position, it is important to have fluency in both Korean and Vietnamese. Before I enter the company, I went to school library everyday and read books to improve my Korean. With friends, we did peer-editing for others’ resumes and practiced possible interview questions together.” In addition, for the question that was asking the reason why she decided to work in Korea, she answered, “With the work experience in Korea, I can get a better job opportunity back in Vietnam. Even more, if I go back to the branch of this company in Vietnam, I can be placed at upper position because I learned practical business skills in headquarter. ” She also added that she is always excited to learn more Korean language and culture in the company. Not too far away from now, the days when members from diverse nationalities are blended and work together in domestic companies will arrive. For the international students, getting a job in Korea will be a good chance to learn technologies and organizational culture of Korean companies. For the company, it will be a great opportunity to spread Korean entrepreneurship to the world.